We love visitors at McLean, whether to dream or to dine. And you will enjoy touring our three neighborhoods, model homes and custom waterfront-home center. Each neighborhood offers model homes by excellent regional and national builders. South Shore also features our custom waterfront-home sales center, with information of available waterfront lots and McLean’s team of custom-home builders. 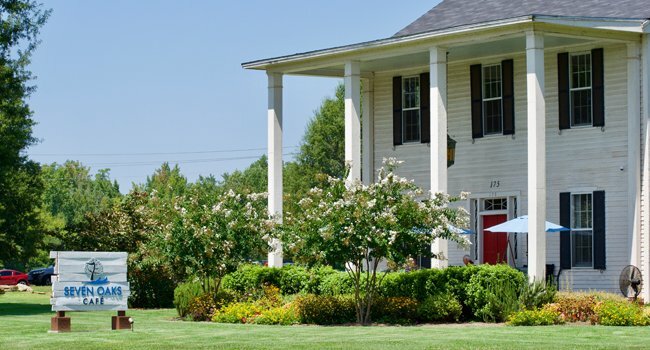 Enjoy great dining Tuesdays through Saturdays at the Seven Oaks Café, a public restaurant located in the historic McLean House at 175 Armstrong Road. Here are the details for models home, the custom-home center and Seven Oaks Café, as of mid-November 2018. General hours are listed below. All of McLean’s six model homes, the custom-waterfront homes center and the Seven Oaks Café will be closed on Thanksgiving Day and Christmas Day 2018 and New Year’s Day 2019. The Café will also be closed Nov. 23, Dec. 24 and Dec. 31. Some model homes plan to be open on Nov. 23, Dec. 24 and Dec. 31. Before visiting on those days, please call ahead to confirm the builder’s model-home hours. Hours: 11 am-5 pm Thursday-Saturdays, 1-5 pm Sundays; and daily by appointment. Hours: Tuesdays-Saturdays 11 am-6 pm; Sundays-Mondays 1-6 pm.